NPR's Staff Diversity Numbers, Updated : NPR Public Editor Part two of a look at NPR and diversity, on air and in the newsroom. Last week I looked at the third year results of NPR's ongoing examination of the gender, geographic, ethnic and racial diversity of its on-air sources — the people who are interviewed on the air, either as experts or participants in events or part of the general public. Later in this column I will look briefly at a couple of the experiments NPR undertook to improve those numbers. But first, it's time to update the figures for NPR's staff diversity. In 2015, the staff of NPR's news and information division, a total of 353 people, was 54.7 percent female, up slightly from 2014. 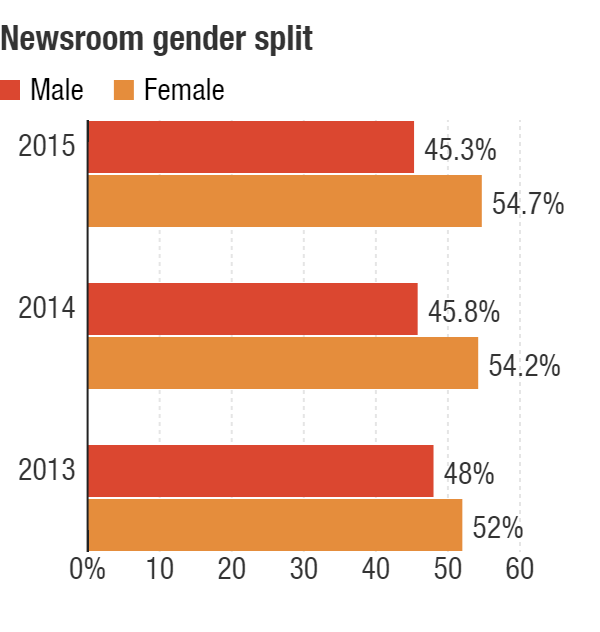 Diversity matters in newsrooms. The more eyes and ears on a story before it goes out for public consumption the greater likelihood that it will include information of interest to NPR's increasingly diverse audience. With a more diverse staff, there's also a greater chance that someone might recognize content that might be offensive to some. NPR's research shows that staff diversity also correlates to the diversity of the people whose voices appear on the radio. In the third year of NPR's source diversity examination, the group that had the largest share of black sources (40 percent) was black reporters. 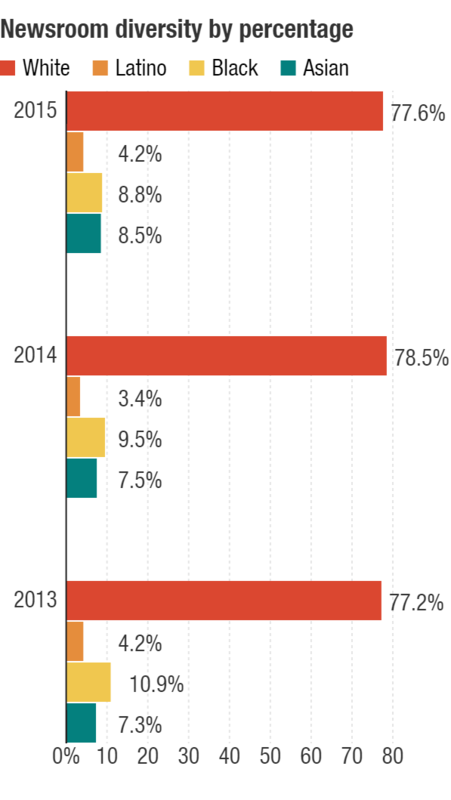 Likewise, Latino reporters' sources were 52 percent Latino. Female reporters talked to female sources 34 percent of the time, compared to just 25 percent of the time for male reporters. There are other ways to boost the diversity of on-air sources. The sourcing figures that NPR released last week were encouraging in their improvement in some categories (although hardly where NPR needs to be overall if it is to reflect American society as a whole). The numbers reflected the outcomes of 14 experiments throughout the newsroom designed to bring more diverse sources into the mix. I asked about a couple of the successful experiments. The international desk decided to see if it could find more female experts to interview by starting with the two most recent female secretaries of state, Condoleezza Rice and Hillary Clinton (this was prior to Clinton's decision to run for president), and asking their offices for recommendations of knowledgeable women who could be tapped as future sources. They also called major universities outside the traditional East Coast Boston-to-D.C. corridor and found many names. "All you have to do is ask," said Edith Chapin, who oversaw international coverage at the time and is now the executive editor of NPR News. Other organizations, including a think tank, were also undertaking public efforts to bring more women into the conversations about international affairs at the same time, she said, "which added great oxygen to our effort." "Part of this is just getting people to recognize that there are women out there" who can provide information and expertise for NPR listeners, Chapin said. "We have to find them." The education desk took a different approach. Steve Drummond, who oversees education coverage, told me that databases of experts are not always useful to his team of reporters, who are often looking for insight into very specific policy issues. Instead, his department's 12-week experiment consisted of simply raising the issue of diverse sources with the team four times every work week, including in staff meetings, and asking everyone on Friday to report on how they did. The efforts were across the board, encompassing gender, geographic region and race and ethnicity, and while the experiment has ended, the effects continue. Drummond said sometimes a change is simple to achieve, by calling, say, an educator in the field, who is more likely to be a woman, instead of the head of a Washington D.C. association representing educators. The process boils down to "not just calling the people we always call," Drummond said. Michael Oreskes, NPR's senior vice president of news and editorial director, echoed that sentiment. If NPR is going to improve the diversity of its sources "you cannot call the same people you have called for 25 years," he said. "A lot of this is about mindfulness, it's about paying attention," he added. "By the way, it's about good journalism. It's about asking yourself the question, 'What have I forgotten to ask? Which phone call have I forgotten to make?' Because a lot of times those extra calls which you may have in your mind as finding a diverse source are actually finding a different kind of source, a better source or at least a different point of view." Keith Woods, NPR's vice president for diversity in news and operations, who oversees the sourcing project, is now reviewing the past year's results with the newsroom. He will also be soliciting new ideas for improving source diversity in the coming year. Hiring a more diverse staff is also a priority, Oreskes said. While that is not new—NPR executives have said that repeatedly, for decades, even—NPR will be trying a new approach. NPR in the past has tended to hire from inside the public radio system, for example looking to employees at local public radio stations. But that does not help the public radio world as a whole. Now, Oreskes said, NPR is examining how it can step up its hiring of people with strong journalism experience from related industries, such as newspapers and television. That is not the obvious strategy it might seem to be; radio requires unique skills and the tendency in the past has been to hire those who are already familiar with the medium. Oreskes said NPR is looking at what kind of retraining might be provided to journalists from outside the radio world, as part of a strategy to broaden its recruitment efforts. I'll be keeping an eye on this important issue in the coming year.